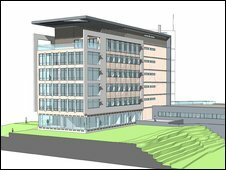 Up to 650 jobs may be created after the announcement that nearly £30m has been secured to expand Swansea University's medical research institute. The enlarged Institute of Life Sciences is to develop better health treatments, products and services and will include a clinical research centre. First Minister Rhodri Morgan said it was a "massive announcement in the knowledge economy in Wales". The institute currently researches diseases such as cancer and diabetes. It opened in 2007 as the research arm of the university's medical school and cost £50m. The university describes the institute as "an innovative hotbed of research activity to discover radical ways to treat disease and deliver health care". The money for phase two is being provided by the university (£6.4m), assembly government (£8.5m), European Union (£12.8m) and Abertawe Bro Morgannwg University NHS Trust (£1m). Mr Morgan said: "This massive announcement in the knowledge economy in Wales shows that we are not just seeking to survive this recession. "We are also positioning Wales in the right place to be competitive in the upturn, when it comes." Swansea University Vice Chancellor Professor Richard B Davies, said it was a "hugely significant" development for the college. "The recent UK Research Assessment Exercise showed the high quality of research in the vibrant Institute of Life Science," he said. "The new funding will allow the School of Medicine to build upon this success, increasing the scale of activity to create a globally competitive centre of excellence in life science research. "The whole region and beyond will benefit from the resulting advances in medical practice and through the development of a cluster of high-technology life science companies." Planning permission is expected to be granted over the next few months and the new building, on university and NHS trust land, is due to open in the summer of 2011.